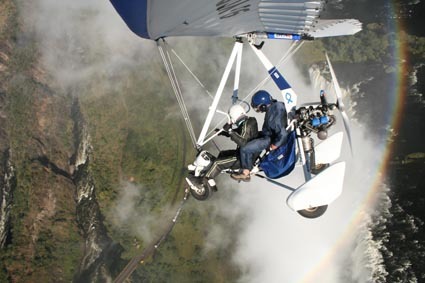 “How would you describe the Victoria falls to your friends at home?” That’s my usual question to each of my passengers, as we soar in the open Mircolight right above the Victoria Falls. I have flown 18,424 passengers so far… and not one was able to describe the beauty of the Falls, like this man: David Livingstone. Yes! He was talking of angels, of flying angles looking down into heaven. Wow! That is exactly what we are doing! Every day. Looking down through the colourful rainbow, into the raging thunder of the falling waters producing white spray and clouds. I would like to share the glory and beauty of Gods creation with you, through the eyes of my passengers, through stories, pictures and words of testimonies .